;The U.S. exports Coca Cola; Japan exports Sony; Russia exports Kalashnikovs." Wounds caused by centerfire rifles are markedly different from those caused by handguns or .22 rimfire rifles. Handguns and .22 rimfire rifles are relatively low-velocity weapons with muzzle velocities of between 650 and 1400 ft/sec. With the exception of the .357 Magnum and the .44 Magnum, muzzle energies are well below 500 ft-lb. The widely proclaimed .45 automatic has a muzzle velocity of only 850 ft/sec, with a muzzle energy of 370 ft-lb. In contrast, the muzzle velocities of modern centerfire rifles range between 2400 and 4000 ft/sec (Table 7.1). The muzzle kinetic energy is never less than 1000 ft-lb; it is commonly in the 2000 ft-lb range and may be as high as 5000 ft-lb. Because of the low velocities and kinetic energies, injuries from both handgun and .22 rimfire rifle bullets are confined to tissue and organs directly in the wound path. In contrast, a centerfire rifle bullet can injure structures without actually contacting them. Before the mid-nineteenth century, most shoulder arms were smoothbore with a caliber of .69 to .75. They fired of soft lead balls of 484 to 580 gr. The propellant was black powder. Muzzle velocity was from 590 to 754 ft/sec.1 Because of the low velocities of these spherical balls, the injuries produced were confined to tissue and organs directly in the wound track.2-4 The wound entrance was round and approximately the size of the ball; it was surrounded by an extensive area of ecchymosis. The wound track through the tissue was greater than the diameter of the ball. Musket balls usually lodged in the body. The exit wound, if present, was characteristically larger than the entrance. When these bullets struck bone, they often lodged in the bone or flattened against it. If the ball struck the bone at maximum velocity, it was capable of causing severe damage with extensive comminution of the bone and displacement of bone spicula along the wound track. The 1850s saw the introduction of conical bullets (Minie bullets). These bullets ranged in caliber from .67 to .69. They had a conical shape, were made of soft lead, and weighed from 555 to 686 gr.1 These bullets could be loaded in either smooth-bore or rifled weapons. The most significant difference from the spherical bullets was the sharp increase in velocity. Initial velocity with such ammunition ranged from 931 to 1017 ft/sec. The wounds caused by these bullets showed enormous destruction of tissue and were much more severe than injuries from the old round balls. The use of these weapons in combat — for example, the American Civil War — brought about numerous accusations of the use of explosive bullets.2-5 The increased wounding effectiveness of such ammunition was due to the fact that whereas the bullet weight was equal to or in many cases greater than that of the spherical bullet, the velocity was markedly increased. Thus, these conical bullets possessed significantly greater kinetic energy to inflict wounds. 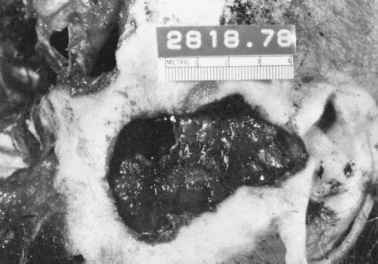 Bone injuries from conical bullets were extremely severe.23 The term used to described them at the time was "explosive. "* Pulpefaction of soft tissue secondary to fragments of bone and disintegrating particles from the bullet were described. Large wounds of exit were present. By the late nineteenth century, most rifles were generally of .40 to .50 caliber. The .45-70 cartridge adopted by the U.S. Army in 1873 is a typical example of the large-caliber black powder weapons in use. A typical loading for this cartridge was a 500-gr. bullet with a muzzle velocity of 1315 ft/sec and muzzle energy of 1875 ft-lb. The introduction of smokeless powder at the end of the nineteenth century led to a general reduction of caliber so that most military weapons were of 6.5- to 8-mm caliber. Bullets used in these weapons were roundnosed and full metal-jacketed, weighed around 220 gr., and had a muzzle velocity of approximately 2000 ft/sec. Wounds produced by these bullets were believed by some authorities to be less severe than those due to the conical lead bullets.2-4 Such observations were probably correct. These new bullets, being full metal-jacketed, tended to pass through the body without any deformation, thereby losing less kinetic energy than the conical lead bullets, which, being easily deformed in the body, lost large amounts of kinetic energy. Discussion of rifle wounds in the medicalliteratureis concernedalmost exclusively with injuries from militaryammunition. Woundsencountered by pathologists and medical examiners, however, often involve hunting ammunition. The design and construction of bullets used in hunting ammunition is radically different from that of military ammunition. Because of these differences, the wounds produced by hunting ammunition are much more devastating. * In reviewing the literature concerning firearms wounds through the ages, one is struck by the recurrent use of the term "explosive" to describe wounds produced by newly introduced weapons or forms of ammunition. This term has been used to describe wounds produced by conical lead bullets, jacketed bullets, hunting bullets, and the M-16. Before discussing rifle wounds from centerfire cartridges, one has to decide what a high-velocity centerfire rifle cartridge is. For the purpose of this discussion, it is defined as any cartridge with a centrally located primer intended to be fired in a rifle of caliber .17 or greater whose bullet is propelled at a velocity of more than 2000 ft/sec. The .30-caliber M-1 Carbine cartridge is neither a rifle nor a handgun cartridge. It has a bullet weight of 110 gr., a muzzle velocity just below 2000 ft/sec and muzzle energy of 955 ft-lbs. Wounds produced by the full metal-jacketed .30 Carbine bullet more closely resemble those from a Magnum handgun bullet than those from a centerfire rifle, whereas the wounds produced by soft-point or hollow-point ammunition are much too extensive to be ascribed to handgun cartridges and most closely resemble in severity those seen with a rifle cartridge. Thus, the .30 Carbine cartridge lies in a transition zone between rifle and handgun cartridges in terms of wounding. The construction of the bullet loaded in the .30 Carbine cartridge case determines whether the wound is handgun-like or rifle-like. Beginning in the late 1930s, the Germans and the Russian military began the development of intermediate rifle cartridges. While these cartridges were considerably more powerful than pistol cartridges, they were significantly less powerful than traditional rifle cartridges. They were intended for a new class of weapons that we now know as Assault Rifles. Traditional rifle cartridges possess more than 1,900 ft-lbs (2,575 J) of muzzle energy. In contrast, intermediate cartridges have muzzle energies of between 1,000 and 1,500 ft-lb (1,360-2,030 J) (Table 7.2). The first of the intermediate cartridges to see use was the 7.92 x 33 mm. It was used in World War II by the Germans in the StG-44. Currently, only three intermediate rifle cartridges are in widespread use: the 5.45 x 39; the 5.56 x 45 and the 7.62 x 39 (Table 7.2). These are discussed in the section on assault rifles. Research by the military has revealed that the feature of a rifle bullet's interaction with soft tissue that contributes most to the severity and extent of the wound is the size of the temporary wound cavity (see Chapter 3). The size of this cavity is directly related to the amount of kinetic energy lost by a bullet in the tissue. Rifle bullets, by virtue of high velocities, possess considerably more kinetic energy than pistol bullets. Table 7.1 illustrates the muzzle velocities and kinetic energies of some typical handgun and rifle bullets. The marked contrast in the kineticenergypossessed by riflebullets in comparison to handgunbulletsis evident. 5. The biological characteristics of thetissuesthroughwhichthebullet passes. By virtue of high velocities and thushigherkineticenergies, riflebullets have the potential to produce extremelysevere wounds. Formilitaryammu-nition, velocity, and stability of the bulletinthetissuearethemostimportant determinants of the severity of the wound, as military bullets have a full metal jacket that usually prevents deformationof thebullet. In contrast, in hunting ammunition, bullet construction plays a role equal to or greater than that of velocity in determining the extent and severityof the wound. A huntingbullet is designed to deform in its passage throughthebody, producinganincrease in its presenting area; this trait, plus a tendency toshedfragmentsof lead core, results in greater kinetic energy loss and thus greater tissue injury. The two types of wound tracks producedwhenabulletpassesthrough tissue are the permanent wound track and the temporary cavity. As a bullet moves through the body, the tissue adjacent to the bullet's path is flung away in a radial manner, creating a temporary cavity. The size of this cavity is directly related to the amount of kinetic energy absorbed by the tissue. This cavity may be as much as 11 to 12.5 times the diameter of the bullet for centerfire rifle bullets.6 The cavity undulates for 5 to 10 msec before it comes to rest as a permanent wound track. Organs struck by these bullets may undergo partial or complete disintegration. The pressures generated are sufficient to fracture bone and rupture vessels adjacent to the permanent wound track but not directly struck by the bullet. As the cavity collapses, tissue is often ejected from not only the exit but the entrance as well. Thus, when an individual is shot through a clothed area of the body with a rifle bullet, it is not uncommon to find ejected tissue, such as muscle or fat, on the inner surface of the clothing adjacent to both the entrance and exit holes. The amount of this tissue is usually greater at the exit site. The severe nature of wounds from centerfire rifles is due to the large temporary cavities produced, exceeding the limits of elasticity of the tissue and organs. Body organs can absorb only a certain amount of kinetic energy and therefore a certain size of temporary cavity before the limits of their elasticity are exceeded and the organs shatter (pulpify). The severely destructive properties of rifle bullets are not possessed by handgun or .22 rimfire rifle bullets. The low velocity of the latter bullets, with resultant low kinetic energy imparted to the tissue, results in small temporary cavities that do not exceed the elastic limits of organs.